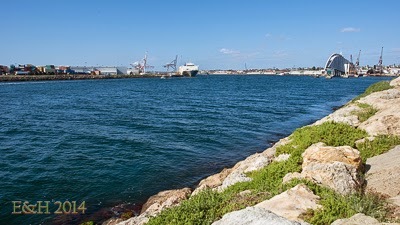 You would like to capture long exposure photographs in daylight? Then you need to significantly reduce the amount of light reaching your camera sensor. 'Black Glass' (BG) is a popular term for Neutral Density (ND) filters reducing the light by 10 stops, which means by a factor of 1000! Such filters are very, very dark and once attached to the lens of your DSLR you can't really see through, and in most cases the camera will be unable to focus or measure for exposure settings. How to determine the camera exposure settings? This is where the Photoxor C1 filter calculator comes to help. For some background reading on 'Black Glass' do a Google search or have a look at Peter Hill's excellent article. In Photoxor C1 define the filter characteristic of your BG filter. Go to Settings --> Filter List and press Add Filter. Alternatively you can use the 10-Stop filter characteristic (universally called 'ND 1000 / ND3.0 / ND110 (10.0)') shipped as part of the Photoxor C1 default filter configurations. First, setup the scene without the BG filter attached. Set your camera to RAW mode if available. Whenever possible capture your images in RAW format ; this allows for better adjustments of the result. Put your camera on a tripod and frame the scene. Focus your scene and then make sure the focus distance is set to manual. Set the white balance; best use custom mode. For RAW capture you may skip this step and adjust later as part of post-processing. Set the exposure (without filter), again use manual mode, and do so for ISO too. Take a reference photo and adjust exposure / focus if needed. Now it's time for Photoxor C1. Start the application and go to the Exposure Filter screen. 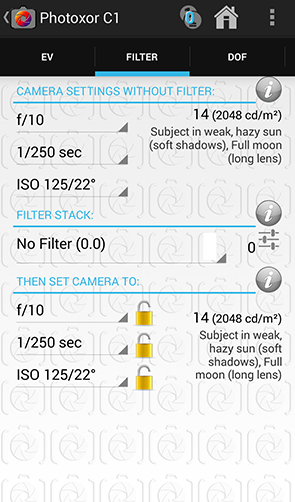 Under 'Camera Settings without Filter' enter the exposure data of the reference image from above. Note: add only filters you attach after taking the references photo! 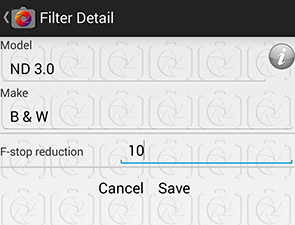 Select the characteristics of your BG filter. In case you have got the Filter Stack extension you can define a stack of filters, for example you might use multiple ND filters to achieve the BG effect. Be careful not to change composition or focus distance! 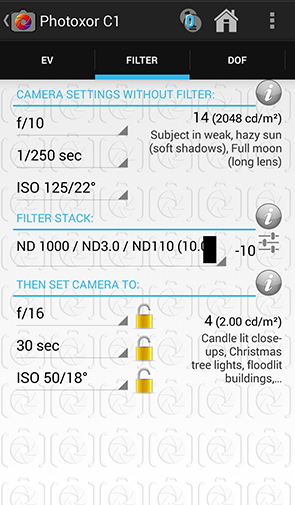 Set the exposure time, aperture, ISO as calculated by Photoxor C1. For best results consider remote release. 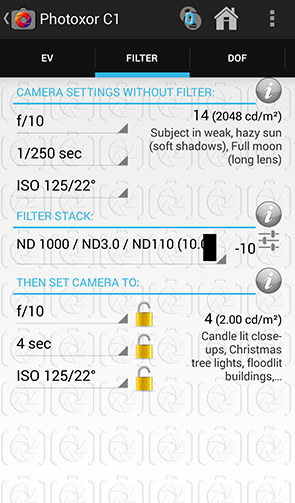 From version 1.4.6 onwards Photoxor C1 provides a builtin timer for exposure settings of 3 seconds and longer. Set you camera to BULB mode, press shutter release and the timer button. Now the timer counts down and gives you an alert when to close the shutter. If you find the image over or under exposed in comparison to the reference image, you might want to adjust the filter characteristics in Photoxor C1 (reduce or increase the light reduction factor (stops) of the filter). The Filter Stack extension allows you to fine tune the light reduction in fractions of a Stop, for example set it to 10.1 if your result was a bit to dark. The free version only supports definition in full stops. 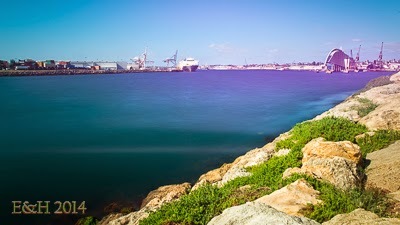 Post-process your image in a tool such as Lightroom or Photoshop.